Joseph Gale’s background is in environmental physiology with a parallel career in military and civilian aviation. Currently, he is Emeritus Professor at the Hebrew University, Jerusalem, where he teaches a course on astrobiology. Astrobiology of Earth is written partly to assist students “to see the forest, not just the trees” and in this it is successful. The first chapter consists of an attempt to define life as we know it and the role of water. Successive chapters then examine the Universe from a biological point of view before moving on to how the formation and history of the Solar System provided conditions on Earth suitable for the emergence of life, describing the conditions necessary for this on the cosmic scale. Other planets and their moons are briefly discussed from this standpoint before moving on to Earth’s role as a source for life in the Solar System. Conditions on the early Earth are then examined, particularly the role of the Moon and Sun and the formation of the atmosphere. A summary of hypotheses of the origin of life is given followed by a section on the origin of photosynthesis. Subsequent chapters describe the evolution of life and the concomitant changes in conditions on Earth together with events such as mass extinctions which have helped to shape it. Mechanisms of evolution are then described with a section devoted to extremophiles. The penultimate chapter focuses on human evolution and interaction with the biosphere and is an informed and up to date examination of the effects of population growth in the last century and a half. This includes a section on anthropogenic climate change and the many counter-arguments against the popular interpretation of the causation of this, with reference to the numerous instances of past climate change unrelated to human activity. The last chapter on the search for extra-terrestrial life deftly addresses the problems attendant on human exploration of the Solar System and the likelihood of extraterrestrial life. This chapter also contains an interesting section, which draws usefully on the author’s experience, on controlled environment life-support systems such as biospheres that would fulfil the nutritional and physiological requirements for humans on a two and a half year round-trip to Mars. There are useful summaries at the end of each chapter, and appendices on use of the text as a teaching aid, additional notes on recent publications and a very extensive list of references and resources. I found this book clearly-written, interesting, informative and stimulating. It is well constructed and logically ordered. Its exposition of how life developed on Earth, including human evolution, and examination of human influence on the biosphere serve very effectively to place the importance of Earth as the only hitherto known source of life fully within a cosmic context. However, the focus on Earth-based life and its evolution is the source of a significant caveat. The early sections of the book, particularly those relating to the Sun and the Solar System, are not as well-founded as later sections which focus on biology. This is partly a result of the over-simplification necessitated by lack of space and the laudable desire to address all aspects of a multidisciplinary subject but there are some factual errors: the Earth’s magnetosphere and magnetic field are not terms which can be used interchangeably; Uranus’ axial tilt is 98 degrees, not “about 90 degrees”, and because of this it does have seasons at its poles, admittedly extremely long ones; and solar flares are not “periods of intense solar wind”. There are also many references to articles in Wikipedia. While recognising that many students will consult this resource its limitations should be more fully addressed. 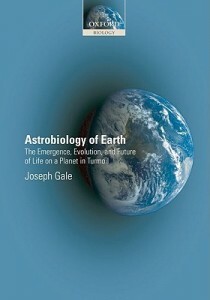 Astrobiology of Earth is aimed at undergraduate level and, while appealing to many students of the subject, to whom I would recommend it as a suitable text for placing the Earth in an astrobiological context, it might also be suitable for students of environmental science seeking a succinct and balanced account of man’s relation to the biosphere from a cosmic perspective. For those students approaching the subject of astrobiology from an astronomy or planetary science background I would only recommend this text as a supplementary source for further reading. Mr Gale. On page 112 You mention early bacteria that consumed chlorophyl. Where did this chlorophyl come from?